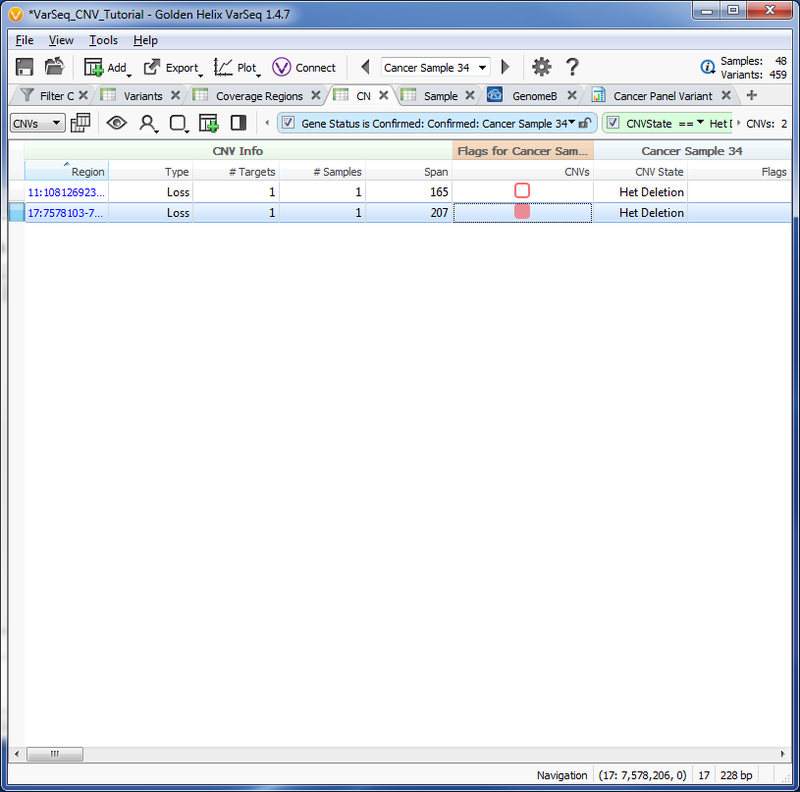 This brings up the Select Data Source window which allows the annotation track selection. 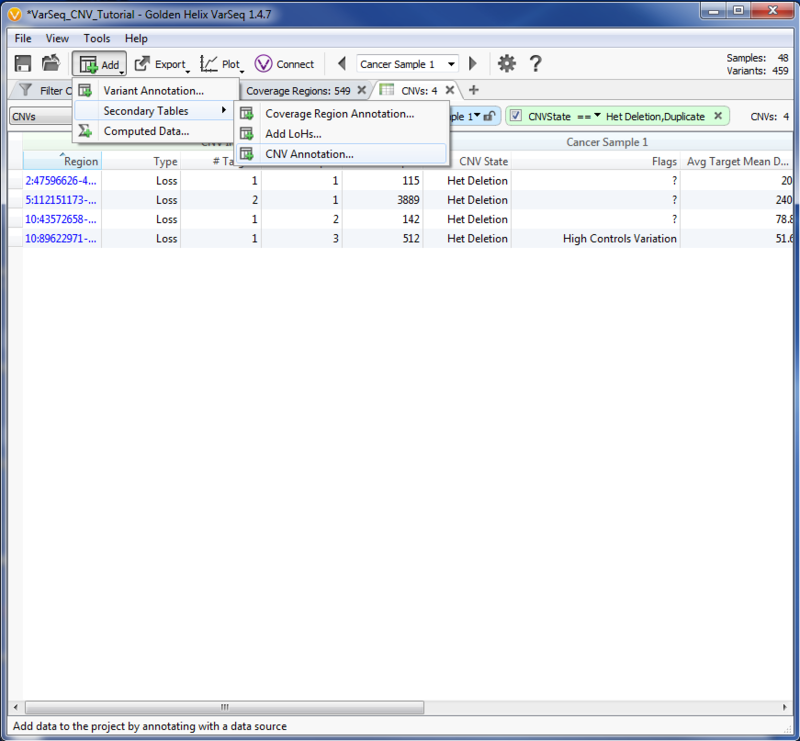 Multiple annotations can be selected at the same time by selecting multiple annotation tracks and checking the associated boxes next to the annotation name. Once all of the desired annotation tracks are selected, click Select to apply the annotations. Any annotation tracks not saved on the local hard drive will be downloaded, and a progress bar window presented that shows the download status. This creates a series of new columns under the CNV table tab. 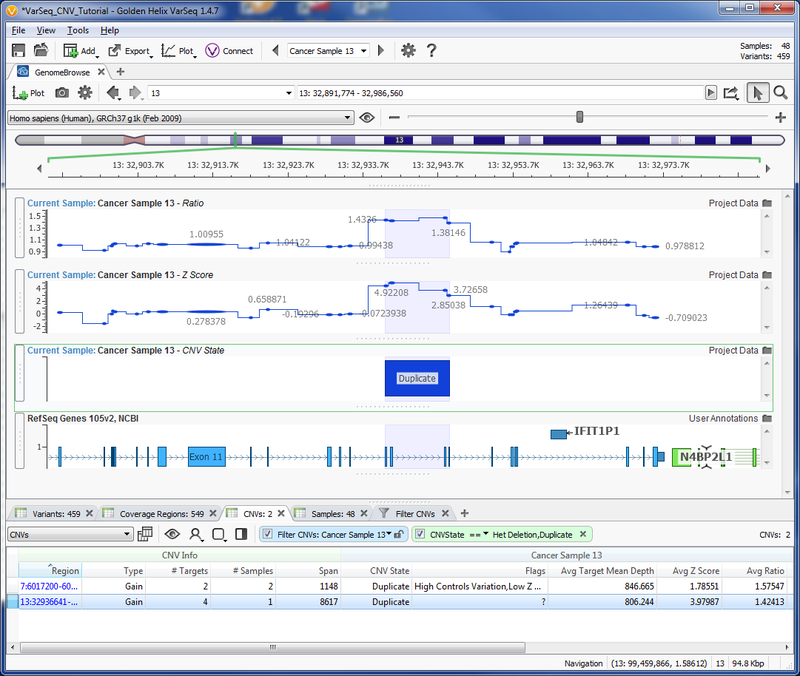 Depending upon the annotation source, the the top level categories can include overlapping CNVs, Transcripts, Regions, and Genes. 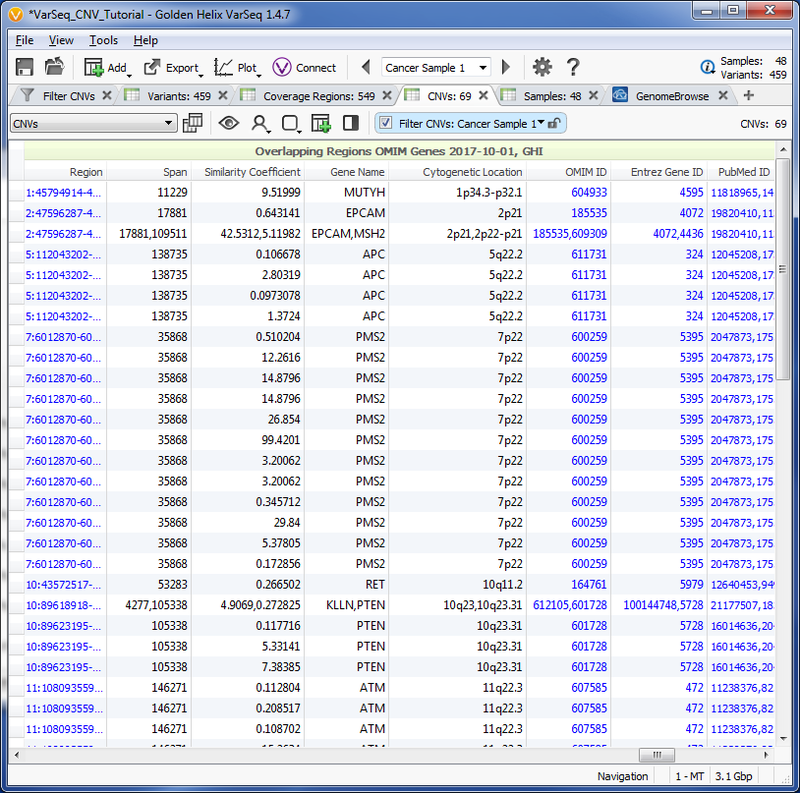 Each of these top level column headers has a variety of specific annotation information; all of which can be sorted, plotted, queried, and added to the filter chain for additional filtering. Figure 6-3. Table after CNV annotations applied. Depending on the size of your panel, you may only have a handful of CNV events called and can at this point inspect and interpret them all. If you are working with larger panels and exomes, it will be useful to filter out CNVs that are low-quality calls and those that may not be safely ignored due to their annotations. We will create a filter chain to specify a range of sample values to analyze. 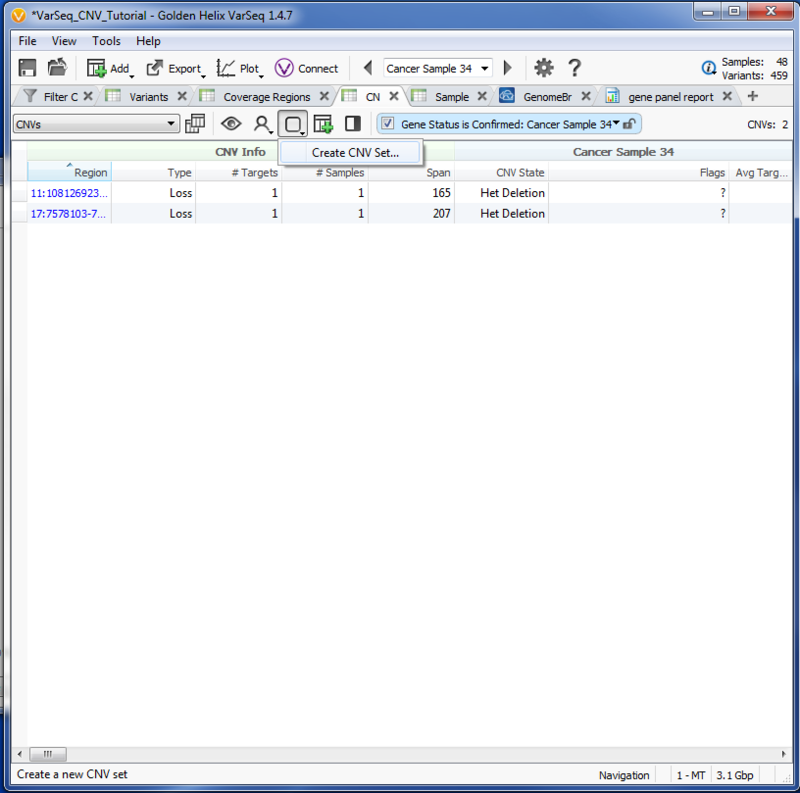 To construct a filter chain from the CNV table, right click on the desired filter column and selct Add to Filter Chain. 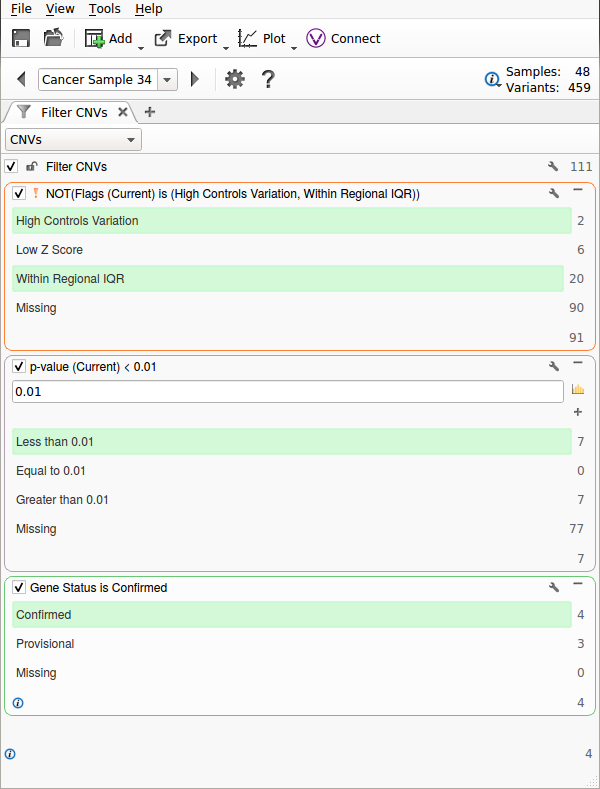 For this example, select Cancer Sample 34, select the CNV table, and right click on the Flags column and select Add to Filter Chain. This will show the Filter tab and show the newly created Flags filter. We can select the opposite of the filter tab options by right clicking on the Flags filter tab title and selecting Inverted. This change is reflected in the ! NOT note now in the filter tab title. 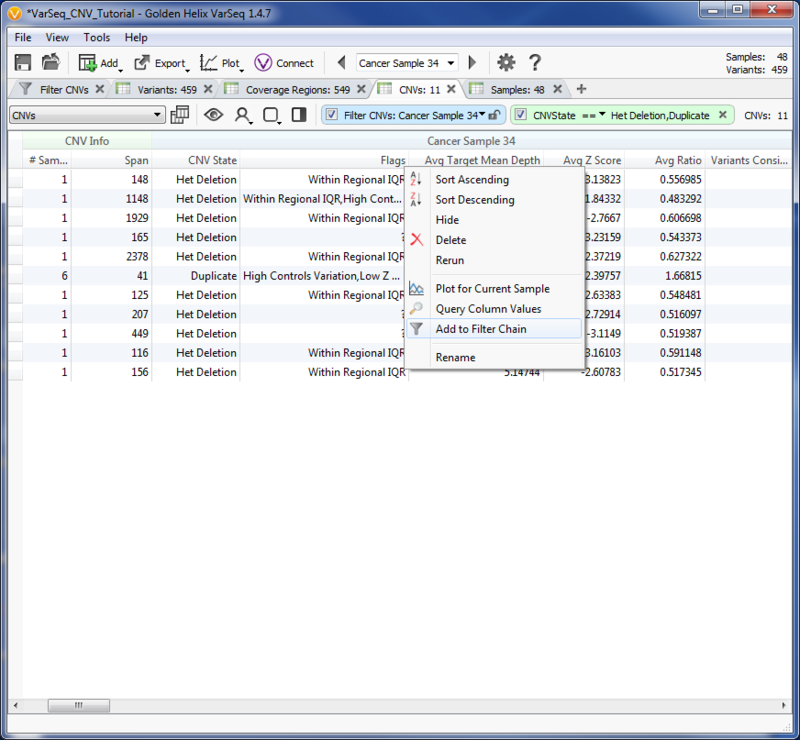 Of the four options in this filter tab, select the options, High Controls Variation and Within Regional IQR. Select the Less than 0.01 option. 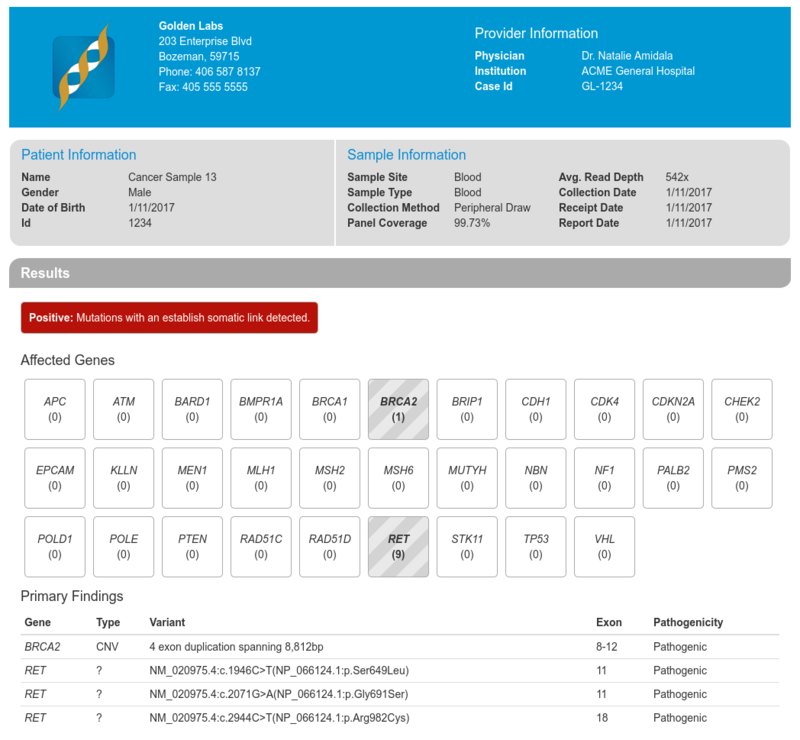 For one more filter, return to the CNVs tab, scroll over to Overlapping Regions OMIM Genes 2017-10-01, GHI and right click on the Gene Status column header to add a Gene Status filter to the filter chain. On the Filter CNVs tab, select Confirmed in the Gene Status is Confirmed filter card. Next, we will examine a few of the CNVs called by the algorithm. We will begin by looking at a heterozygous deletion in BRCA1. 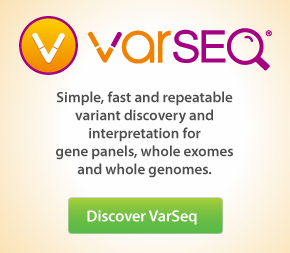 Select Cancer Sample 7 from the sample selection dropdown at the top of the VarSeq window. 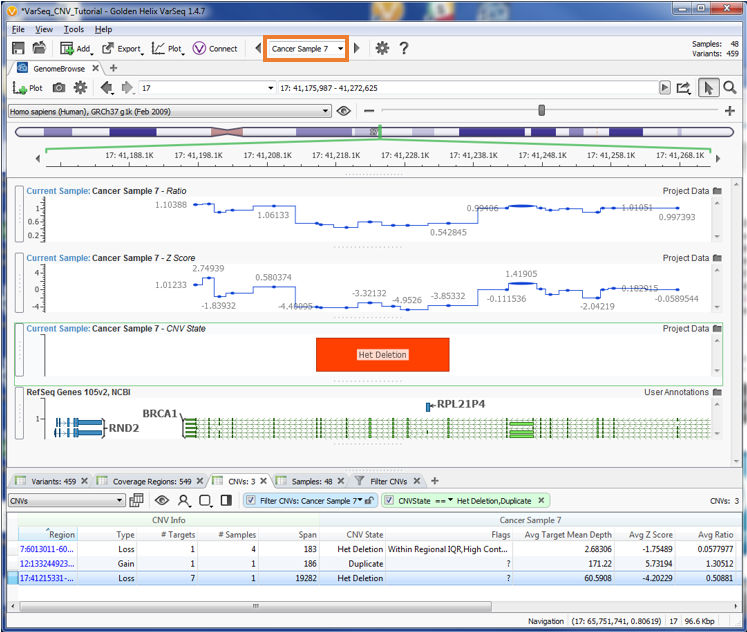 Next, zoom out using the minus button to see the surrounding region in GenomeBrowse. 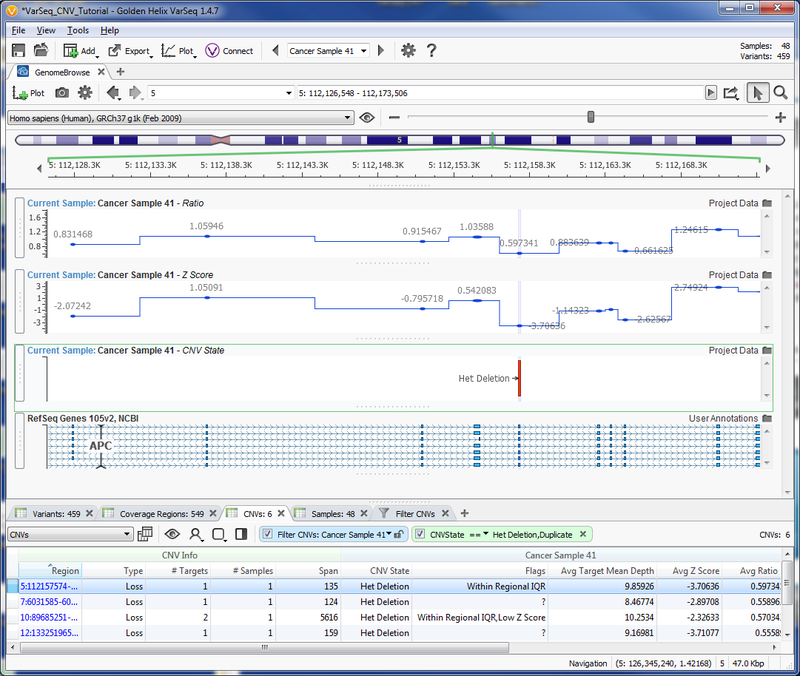 The GenomeBrowse plot shows that there is strong evidence for this event. Since it is called as a heterozygous deletion, we expect that the normalized coverage will be about half that of the reference samples, leading to a Ratio of around 0.5, which is exactly what we see for the targets within this event. Additionally we would expect a low Z-score indicating three or more standard deviations form the reference sample mean. The Z-scores shown in the plot are all less than -7 indicating extreme deviation from the reference samples, supporting the heterozygous deletion call. Next, we will examine a duplication event in BRCA2. Once again zoom out using the minus button to see the surrounding region. For a copy number 3 duplication we expect a Ratio of around 1.5 and a Z-score greater than 3. The duplication shown above falls in line with these expectations, with all targets having a Z-score greater than 7 and a Ratio around 1.5. Thus, it appears that we have strong evidence for this event. Finally we will look at a single exon heterozygous deletion in BRCA2. Then, select the second row of the table and zoom out using the minus button. While this event has an extremely low Z-score, the surrounding region is very noisy in terms of both Z-score and Ratio. Additionally, the Ratio value of around 0.61 is not as low as we would expect for a heterozygous deletion. Our suspicions are verified by the Within Regional IQR flag shown in the CNV table, which indicates that the signal used as evidence for the event falls too close to the noise of the surrounding region. These factors lead us to view this deletion as questionable. Now that we have finished our interpretation, and filtered down to the CNVs of interest, we can create a report, as shown in the example below. First a record set is created by selecting Cancer Sample 34 and looking at the CNV tab. 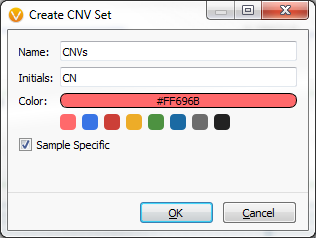 To create a record set, click the square with rounded corners icon and select **Create CNV Set...*. This displays the following dialog box with allows specific record set name and color changes. This tutorial keeps and accepts the default values by selecting OK. The record set can be found on the CNV tab on the right of the CNV Info main column header. We will select the second entry by clicking on the icon in this column. Now we will create the report by selecting the plus sign on the tab bar to create a new tab and select Report. 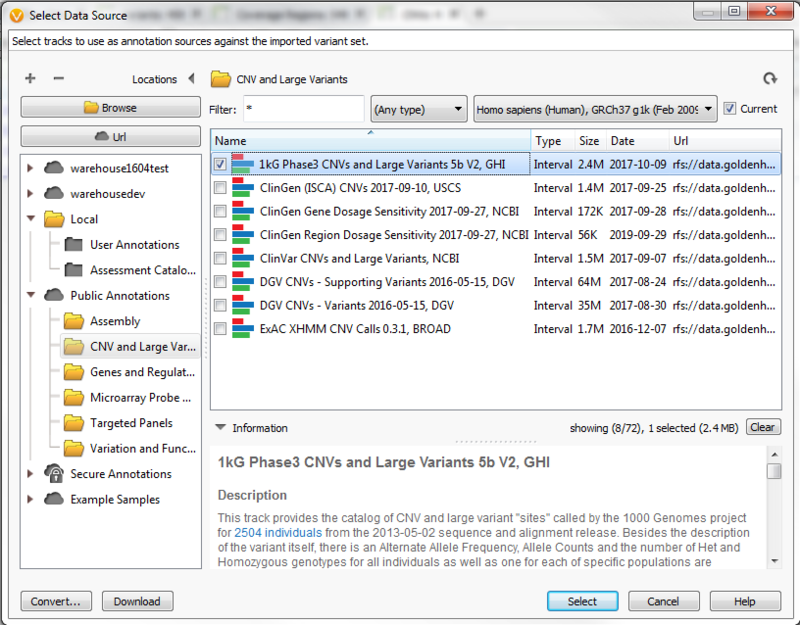 On this new report tab, click on the drop down template name menu and select Cancer Panel Variants and CNVs from the list of default template names included with VarSeq. To use the CNV record set created in the previous section, scroll down the report until the CNV Findings section is found. Click on the “Select a CNV Set” dropdown menu and select the CNV record set that was created. This expands the CNV Findings section to allow for additional record set classification and interpretation to be entered into the report. Once all of the information has been entered, the swirling arrow icon on the top of the report section is selected to create the report. The created report is shown below.